I write poems and stories for people of all ages, often with a tinge of magic, science, or deep time. I am delighted that Eagle Books, an imprint of Sophie Masson's Christmas Press, will publish my middle-grade fantasy adventure novel The Girl in the Mirror in 2019. Find some of my poems online at Eureka Street, Backstory Journal or Strange Horizons. My poetry prizes include first place in the New England Thunderbolt Prize for Crime Poetry 2017, the Connemara Mussel Festival Poetry Competition 2016, and the Humorous Verse section of the Henry Lawson awards in both 2014 and 2017. I won third prize in the prestigious ACU Prize for Literature 2014, and more poems were shortlisted for it in 2015 and 2017. Read my poem "All the dead people", which received a Special Commendation in the WB Yeats Poetry Prize for Australia in May 2018. In November 2016, I won two prizes in the Sisters in Crime Australia Scarlet Stiletto Short Story Awards for my story "Cooking up a Murder": a mystery set in clasical Delphi, with an amateur sleuth who happens to be a Pythia of Apollo. If that makes you curious, read my blog post, or buy a copy of the ﻿Scarlet Stilettos anthology﻿. The story was reprinted in the 2017 Award Winning Australian Writing. I love to write for kids as well as adults. My poems and stories for kids have been published in the School Magazine, Our Home is Dirt by Sea: Australian Poetry for Australian Kids, Stories for Nine Year Olds and other wonderful places. Kids aged 11 plus should enjoy my poetry books The Loyalty of Chickens and The Duties of a Cat. Read more about my work for kids! Melinda Smith launched my first full-length book of poetry in April 2017, The Loyalty of Chickens, from Piitt Street Poetry. Gwynneth Jones' gorgeous chickens glorify the front cover. We've carefully designed the collection to be suitable for readers from eleven to eleventy-one. Magdalena Ball says, "It’s rare to come across a collection that is suitable for such a broad age range, and yet Blackford... manages it perfectly... 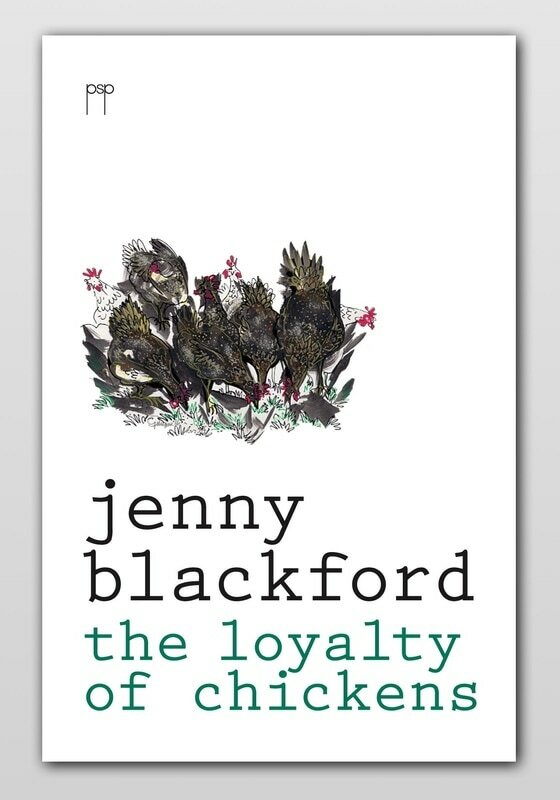 The Loyalty of Chickens is an utterly delightful book." Jonathan Shaw says, "One of the attractive features of this book is the way poems that are eminently suitable for children are mixed in with poems of mature sensibility, with no sense of incongruity. The lovely imagistic ‘sweeping’ (‘the wind is sweeping / the tide out to sea’), is followed by ‘South Steyne’, which recalls childhood events from an amused adult perspective (‘The South Steyne ferry was heaven / for me, though doubtless hell for parents’), and then by ‘Some slight redemption’, a meditation on Coventry Cathedral as a monument ‘not to war / nor even peace / but to forgiveness’." Read more about THE LOYALTY OF CHICKENS. In late 2013, award-winning Sydney imprint Pitt Street Poetry published a pamphlet of my cat poems, The Duties of a Cat, with seven glorious drawings from Michael Robson. Much-awarded poet Judy Johnson said, "This is a lovely, complex and thought provoking little poetry book about the inner and outer lives of cats. I was struck by the nuance and complexity the author managed to bring to the poems–how they opened up from their particular descriptions of animal behaviour into the larger emotional world we all share. There is wonderful sound play in the poems which make them a joy to the inner ear as well as the eye. ... High quality cream paper and exquisite drawings by Michael Robson seem to further deepen and illuminate the text. Highly Recommended." Nebula-winner Eileen Gunn said, "What a lovely chapbook! Enchanting drawings and enchanting poems. A must-have book for people who must have cats!" Read more about THE DUTIES OF A CAT. My short stories for adults have appeared in magazines and journals including Cosmos, Penumbra and Aurealis, as well as in anthologies such as Jack Dann's Australian showcase anthology Dreaming Again. They have been published recently in Helios Quarterly, A Quiet Shelter There (a project to raise funds for an animal shelter), (ed. Gerri Leen), and Hear Me Roar!, (ed. Liz Grzyb). (Read an excellent review by Juliet Marillier.) Many of them have earned Honourable Mentions from Gardner Dozois, Ellen Datlow and Rich Horton. Read more about my stories. Archaeology buff Eric T. Reynolds commissioned me to write The Priestess and the Slave, a historical novella set in fifth century BC Athens and Delphi, as the first in an innovative Hadley Rille Books series of archaeologically-accurate short novels about the daily lives of ancient people coping with real historical crises. It was published in April 2009. Read more about THE PRIESTESS AND THE SLAVE.